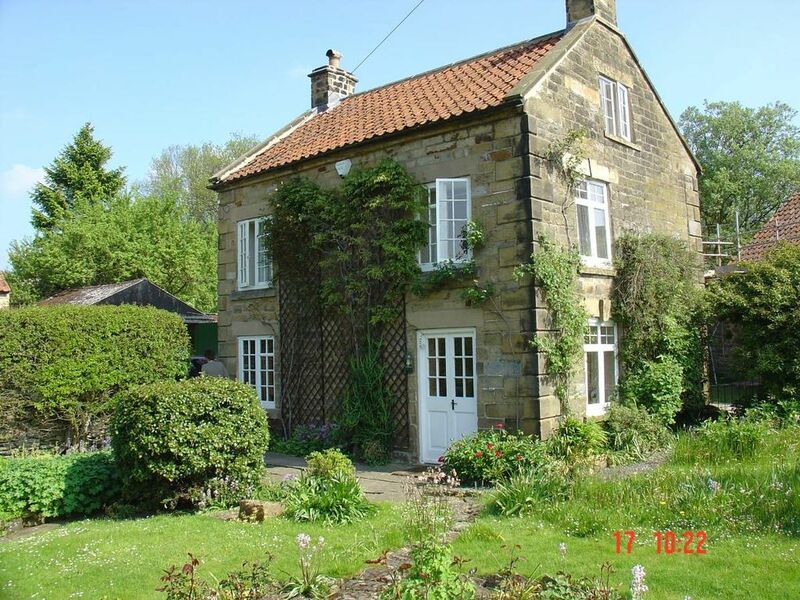 Holly Cottage is a beautifully presented, large 18th Century detached cottage set in one of the most popular villages in the North York Moors National park. This stone built cottage offers spacious accommodation and is a lovely family home with every home comfort you should need. On the ground floor there is a spacious sitting room with wood burning stove, enough comfortable seating for 8 guests and double doors leading into the enclosed garden which has beautiful views over the village. This leads to a large garage and drive with plenty of room to park 2 cars. There is a separate dining room and kitchen, downstairs cloakroom with toilet and wash hand basin and a spacious hall. The first flight of stairs leads to the first twin bedroom with double aspect windows overlooking the valley and village. The next bedroom is also a twin room with with beautiful views over the valley. There is a large bathroom on this floor with a separate shower and roll top bath and a large double bedroom with a four poster bed and an ensuite bathroom with shower, toilet and basin. There is also a flat screen TV in this room. The second flight of stairs leads you to the second floor attic room which is a very large double bedroom with superb views across the village and valley. Hutton-le hole is situated in one of the most picturesque villages in the North York Moors National Park. This beautiful village has various gift shops, a chocolate shop, candle shop, craft shop, many tea rooms, and a newly refurbished pub which serves great food and all within a few minutes walk from the cottage. There is also an award winning museum in the heart of the village which is well worth a visit. Many visitors spend summer days with a picnic by the stream. Holly Cottage is furnished and decorated to a high standard and is the perfect retreat for families and friends to relax and enjoy the village and surrounding areas. Free wifi also included for those that need it! Liz and Gary bought Holly Cottage in the year 2000 after holidaying in Hutton-le-Hole when Liz was a child and wanting to bring her own children to the village that she loved. They still use Holly Cottage as often as they can. We bought Holly Cottage in January 2000. This was our project for the new millennium! There was a lot of work to be done so we got to work renovating it and managed to complete all the work in 7 months. We then started letting it and have done since July 2000 and have continued updating the cottage with decoration and furniture every year. We holiday ourselves in Holly Cottage as often as possible and still love spending as much time there as possible. Beautiful location overlooking the village and hills. Holly Cottage is even featured on postcards sold in the village. Very spacious and warm - perfect for coming home to after a day exploring. There are 2 bathrooms and 3 toilets in total. We have just refurbished the main bathroom. parking in the garage and on the drive for 2 cars. Cosy stove and comfortable seating for 8 guests. Double doors leading to garden. Lovely cottage in a gorgeous village surrounded by stunning countryside! Cosy and comfortable but still with plenty of space! The property was hard to find but once we did it was a really lovely relaxing long weekend break with friends. Well equipped and spacious. Lovely meal at the pub in the village, kids loved paddling in the stream, we all enjoyed the Ryedale folk museum and other walks and day trips. And great to come home to a log fire! Lovely large cottage in a marvellous location. A lovely cottage in a great location! Holly Cottage was very cosy and well equipped and offered great walks from the door. Perfect for our family to celebrate the New Year together! A family of 8 including 3 grandchildren had a fantastic 3 day break with plenty to do,including the Santa special at Pickering .Everyone wants to return next year. Hutton-le hole is situated in one of the most picturesque villages in the North York Moors National Park. This beautiful village has various gift shops, a chocolate shop, tea rooms a newly refurbished pub which serves great food and all within a few minutes walk from the cottage. There is also an award winning museum in the heart of the village which is well worth a visit. Many visitors spend summer days with a picnic by the stream. Located approx. 30 miles from York and 25 miles from the Coast. Good roads give easy access to Heartbeat Country and the Pickering Steam Railway.